Alexander John Nicholson was born at Blackall, Co Meath, Ireland, on 25th March 1895. His parents had also been born in Ireland, although both came from English yeoman families of, at least on his mother’s side, powerfully Methodist convictions. His father was a successful designing engineer, his mother a woman of acute and independent mind, and his elder brother an inventive member of the Royal Flying Corps. Of his two younger sisters, Nan, a trained kindergarten teacher, lived in Canberra for some years during the thirties and established the first preschool centre on the northern side of the young city. The Nicholsons moved to England, where John spent the rest of his childhood. He shared the family bent for mechanisms and gadgets and the exciting new motor cycles, cars and aeroplanes, but his special interests were in photography and natural history. He became a member of the Birmingham Field Naturalists’ Club (annual subscription one shilling) when twelve years old and, to balance it, joined the Midland Aero Club at fifteen, although there is no record that he actually flew. He entered the Waverley Road Secondary School, then remarkable for its new science laboratories, in 1908, and, despite some concern by his masters that he was more interested in natural history than in his formal subjects, matriculated with honours and an entry prize into Birmingham University in 1912. He graduated BSc in 1915 with First-Class Honours in Zoology, Chemistry as a second subject, and Botany as a minor. He was not impressed with the course in chemistry, which consisted almost entirely in covering the board with structural formulae of dyestuffs, nor with what he termed the ‘necrological approach’ to zoology, which was concentrated on comparative anatomy and ignored physiology and the activities of living animals. Still he did get a grounding in classical evolutionary theory. When the war came John Nicholson, already a member of the University OTC, was commissioned 2nd Lieutenant in the Royal Field Artillery in 1915. He spent most of the next two years instructing – strenuous, because they were only allowed six weeks in which to produce gunners – and the rest of the war on active service in France and Belgium. He was promoted to 1st Lieutenant, twice mentioned in despatches, and awarded the King’s Commendation for bravery. The war left him with a cardiac lesion that limited strenuous activity for the rest of his life, and it was characteristic that even his closest friends did not know of this until after his death. He returned to Birmingham in 1919 to begin postgraduate research on two entomological problems: ecology of the natural enemies of Chermes, an homopteran pest of pine trees; and development of the ovaries in the mosquito Anopheles maculipennis. The latter was a particularly neat piece of work, which has been referred to as a source of information even in recent publications, and he received an MSc for it in 1920. In March 1921, he was appointed the first McCaughey Lecturer in Entomology at the University of Sydney and given permission to spend some months studying entomological research and teaching in USA on his way to Australia. He was profoundly impressed by all that he saw, and especially by the high quality of applied entomology in that country. That trip was a sound investment by the Senate of the University. Up to 1921, entomology was taught as a fragment of the Arthropoda in Zoology, and as a mixture of rather primitive natural history and blunderbus control measures in Agriculture. It was Nicholson’s job to give it substance in both faculties, and this was urgent, because, as his observations in America had shown him, training by apprenticeship was just not good enough any longer in either the academic or the economic field. The state of entomology in Australia, particularly in Sydney, at this time was as follows: productive work in entomology at that time was predominantly taxonomic and predominantly in the hands of educated amateurs, mostly professional men with rather more leisure than is common today; these professionals were all self-trained or had served some form of apprenticeship and had built their careers on a very modest level of secondary education; and finally the study of insects attracted few students in the universities. The basis of both courses was general systematics, morphology, and general biology. Only sufficient of this was given to agriculture students to provide a firm basis for an intelligent development of the subject of economic entomology, to which I naturally had to devote as much time as I could. With science students I made little more than passing reference to insect pests and their control, treating entomology simply as a component of zoology and going into greater detail with morphology, systematics and biology. He had to face three problems in putting his plans into effect. He had to obtain knowledge of the strange Australian fauna that he was seeing for the first time (by going into the field and learning for himself); to devise means to bring his courses to life; and to learn about the pest species and their control. … it became my responsibility for a year or two to care for the [Zoology] Department’s entomological collections. A great deal of this had been collected by Nic across his Sydney years and I was amazed at the industry and the vastness of the field he had covered. It goes without saying that it was all, over 30 years afterwards, perfectly mounted and preserved and it brought alive most vividly AJN’s early field trips in Australia. There remained the problem of balancing his teaching with an adequate leavening of general biology. The special physiology of insects was little known at that time, but Nicholson taught what he could, sometimes, he thought, rather rashly. He inaugurated field excursions to show his students how insects lived and what they did, but there was not room in the timetable for enough of them. As well as pinned adults, his collections included immature stages and the results of insect activity, and these could be used in practical classes; but that was still not enough, so he resolved to supplement his efforts by photography. This could be done in the laboratory, where he was ably assisted by Miss Burns, or in the field, for which he developed an ingenious telescopic range-finder for his camera and learned to use flashlight effectively both in shade and at night. He photographed everything of interest that he saw, and thus was able to illustrate his lectures by a remarkable series of lantern-slides of larval and adult insects going about their normal business in their natural habitats. Nearly forty years later he adapted a Leica camera to do the same work in colour. the period of the professionals. Nicholson’s arrival marked the beginning of the transition between the last two. He put university teaching on a firm scientific foundation, and provided the first agricultural graduates to bring a new approach to economic entomology in this country. Young people interested in insects no longer became doctors or schoolteachers and devoted their leisure to their hobby; they took an appropriate degree in a university and made entomology their profession, with ever widening fields of research and ever increasing technical and financial resources before them. It could fairly be said that, so far as Australia is concerned, Nicholson in a sense began it all. In 1928, RJ Tillyard had returned to Australia as Chief of the newly established Division of Economic Entomology of CSIR. He gathered the nucleus of a staff about him, and they set about helping him to plan the research and the laboratories at Canberra. Tillyard proved to be an extraordinarily stimulating scientist, but an unpredictable administrator. To balance this, the Executive appointed GA Waterhouse (then Curator of the Division) as its Executive Officer. He remained only a year, and in 1929 John Nicholson was offered the position of Deputy Chief which he accepted on the condition that he should spend most of 1930 in England as he had already planned. He undertook a number of enquiries for the Division while abroad, and arrived in Canberra towards the end of that year. He found his position difficult, and the times were difficult too; no new developments could be planned, so he sought transfer, as a Senior Entomologist, to the sheep blowfly investigations, which had been established before the depression began. During the next year and a half, he helped to guide the entomological side of the Section’s work and began two pieces of personal research. One was a study of traps and baits, for which he designed ingenious ways to reduce the action of external variables, and the other a study of the effects of temperature on the activity of the adult flies. Tillyard became ill before the trapping studies were completed and Nicholson was appointed Acting Chief in April 1933, and from then on he had little opportunity for personal research until after the war. The war affected the Division in two ways: it took away nearly a third of the scientific staff on active service, and it caused a reorientation of the efforts of those that remained. 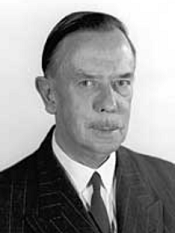 In particular, a strong team, initially under FN Ratcliffe, was directed to studies of the pests of stored products, with results of substantial value to the general war effort; and DF Waterhouse did very valuable work in collaboration with the army medical services on the development of repellents and other entomological aspects of the control of malaria and scrub typhus. a small unit of experimental population dynamics was set up for Nicholson’s own work. Nicholson completed his term as Chief in March 1960, and was appointed to a Senior Research Fellowship to continue his twin studies of population dynamics and natural selection. Details of this research are provided in the biographical memoir written by Ian Mackerras (follow the link in the Source details below). Looking at his publications as a whole, three stand out as having all the qualities of enduring classics: the 1927 study of mimicry, which has been too badly neglected; the 1933 statement of population theory, of which CA Fleschner, of Riverside, wrote (in litt.) in 1970 that it was far superior for teaching the principles of biological control to anything that has been published since; and the 1960 analysis of natural selection, which is so well documented that it should have a deep influence on modern thinking in population genetics and evolutionary theory. He will be long remembered for initiating the professional era in Australian entomology, for his contributions to the development of the Division of Entomology in CSIRO, for the publication of three enduring classics, and, by those who knew him, for his quiet friendliness, wise counsel, and complete integrity. He was foundation President of the National Parks Association of ACT. One of his roles in the Australian Academy of Science was as the first amicus curiae appointed to serve as a link between the young Council and the even younger Sectional Committees. He was the initiator of the Academy’s proposal to the Commonwealth Government for the establishment of a research museum of Australian biology in Canberra and made a significant contribution to the stability and steady growth of the Academy in those early difficult years.